Cumbria’s Police and Crime Commissioner, Peter McCall has formally announced that Mrs Michelle Skeer, Deputy Chief Constable of Cumbria, will take up the permanent position of Chief Constable for Cumbria from 1 April 2018. Peter McCall announced Mrs Skeer as the preferred candidate following a rigorous two-day recruitment process held with an Independent panel in January 2018. On Friday 23 February, in line with the statutory guidelines, the Police and Crime Panel held their confirmatory hearing to consider Mrs Skeer’s suitability for the role of Chief Constable. Following the meeting, the Panel made their recommendation to the Police and Crime Commissioner that Mrs Skeer’s appointment be confirmed. Peter McCall said: “I am delighted to confirm Mrs Skeer as the next Chief Constable of Cumbria, and wish to congratulate her on her success in what has been an extremely tough selection process. Mrs Skeer is a local Cumbrian and thoroughly deserves this appointment, which comes after 28 years of dedicated service to Cumbria Constabulary which was recently recognised by her award of the Queen’s Policing Medal for distinguished service. “I’d like to thank the Police and Crime Panel for endorsing my appointment. “I am greatly honoured to be given the opportunity to lead Cumbria Constabulary, my home force, as Chief Constable. “I consider it a privilege to serve the public of Cumbria in this important role and I look forward to working with the Police and Crime Commissioner, to deliver his Police and Crime Plan and keep the communities in Cumbria safe. 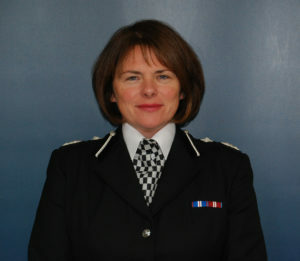 Michelle joined Cumbria Constabulary in February 1990 having completed a degree course in History and Media at Leeds. She performed a variety of uniform operational roles before moving into the Criminal Investigation Department. Within CID Michelle held roles at every rank and led on both public protection and serious crime operations. In 2007 Michelle was appointed Director ofe Professional Standards for the Constabulary where she was responsible for Anti-Corruption, Public Complaints, Disclosure, Information Security and Data Protection issues. In 2009 Michelle was appointed to the position of Assistant Chief Constable in Cumbria taking responsibility for the delivery of operational policing across the County. In addition she led the Change Management Programme successfully delivering the required budget savings. This has included reviews in all areas of business with the aim of delivering the same or more with less money. Michelle has implemented further structural change whilst maintaining performance. In 2009 Michelle was the Gold Commander during the extensive flooding in the County, co-ordinating the multi-agency response. In November 2012 Michelle became temporary Deputy Chief Constable of Cumbria Constabulary giving her strategic responsibility for all areas of business except operational policing. This involved setting the strategic direction for the 2 Directorates – Corporate Support and Corporate Improvement. In January 2014 Michelle returned to the role of Assistant Chief Constable and had responsibility for the delivery of operational policing across the County. In October 2014 Michelle was appointed Deputy Chief Constable of Cumbria Constabulary. In late 2015 Michelle performed the role of temporary Chief Constable and was the Gold Commander during Storm Desmond which again saw extensive flooding across the county. Michelle also holds a significant national policing role. She is the National lead for the Management of Sexual Offenders and Violent Offenders, a role she is passionate about. This role requires close working with a number of different Forces and agencies including Her Majesty’s Prison and Probation Service (HMPSS), National Crime Agency (NCA) and the Home Office. This is a complex and high risk area of business and she is instrumental in the development and national roll out of guidance, new legislation and new management tools. Michelle is also an assessor for Senior Police National Assessment Centre (SPNAC) intended to select future Chief Officers. Michelle is married to a retired police officer, has three children and lives in Cumbria, her home county.